"Store-bought angel food cake, toasted and rolled in sweet condensed milk, with a kiss of coconut for extra sweetness." Toast the angel food cake cubes over the coals of a campfire on toasting sticks until browned. 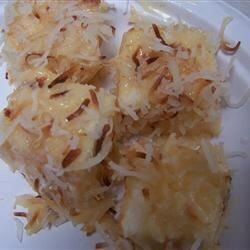 Dip the toasted cake into the condensed milk, and roll in coconut flakes. gotta watch that the kids don't dip first and then toast....unless you enjoy the flame burnt taste that is ! Thanks for a nice change for campfire desserts. And, easy to pack ingredients too.